Last night was the start of Vacation Bible School. 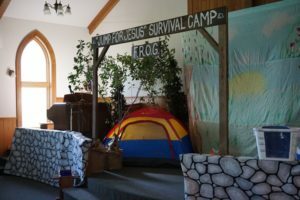 Children visited the “Jump for Jesus Survival Camp”. In case you were wondering F.R.O.G. stands for fully rely on God. Activities followed this theme throughout the night. The kids went fishing while memorizing 1 Peter 5:7 which tells us to “cast our anxieties on Him”. They also ran an obstacle laden relay race “for the glory of God”. Vacation Bible School continues tonight at the Danville site from 6:00 PM until 8:00 PM. Dinner is provided. We hope that you can join us.